In 1947, on an otherwise ordinary morning, around the time of America’s Independence Day, aliens landed on a farm just outside Roswell, New Mexico. Farmer Mac Brazel was the one to find the evidence: metallic sticks held together with tape, chunks of plastic, and foil reflectors. Ill-equipped to deal with extraterrestrial debris, the farmer called the sheriff who, in turn, called officials at the nearby Army Air Force base where all the specimens would ultimately be examined. His adolescent years brought more moving around, more schools to get used to and friends to make. “One of my core survival skills was learning to adapt — learning to make something new out of the new.” As a result, he proudly identifies as a unicorn. Something unique, yes, but also something a little mythical and … elusive. Despite Joshua’s nomadic upbringing, he was active in whatever community he landed in. During high school he played in the band and joined the math club, even competing in statewide calculator competitions. Numbers were a great passion of his, as were languages. Before going to Boston University to study International Finance, he received a Congress Bundestag Scholarship to become an exchange student in Germany, where he quickly learned the language. A semester abroad in Ecuador would add Spanish to the language tally. The 35 countries he eventually worked in would extend the list of languages to include Arabic, French, Mandarin and Swedish. He currently is learning Persian, in case there was any suspicion that he might be losing his touch. Joshua’s life after his graduating from college was marked by a vast array of jobs that were all charged both by the empathy he gained through his upbringing, and a desire to “help people”, as he puts it. He wanted to “be with different types of people and facilitate exchange with and among different cultures.” This desire took him to Morocco where he worked with the Peace Corps for two years. Other countries like Kenya, Haiti, and Myanmar made it onto his travel itinerary for similar reasons. He was always looking for practical ways of engaging with society. 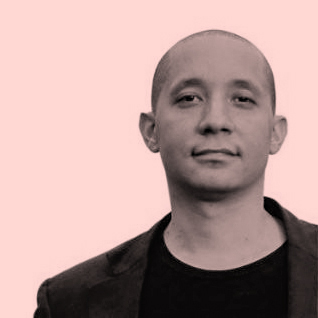 After working on data analytics and software development for large corporations in the UK, US, and Europe, he received a Master’s Degree from The Fletcher School at Tufts University, where he focused on building technology for people living in “developing countries”. His time at the United States Agency for International Development (USAID) yielded a moment that he is particularly proud of. He had orchestrated a civil society innovation program that garnered so much respect that it was mentioned by President Obama during a 2014 address at the Clinton Global Initiative. In 2002, the day after America’s Independence Day, Joshua went on a date with a Harvard librarian. As amber light from the stained glass windows in Boston’s Club Cafe illuminated part of his date’s face, Joshua was concentrating elsewhere. He had started making eyes with another man in the room. In fact, when the librarian went to get drinks at the bar, Joshua took the opportunity to lure the other man over with a cigarette. The mystery suitor took a cigarette out too and they began adding smoke to the fire already between them. Throughout the night Joshua would repeatedly send the librarian to the bar so that he could steal another moment with this intriguing man who, by the end of the night, would surreptitiously put his card in Joshua’s pocket with a request for a call. Joshua and Scott have since spent the last 16 years together. They quit smoking and adopted two garrulous children who have accompanied them on their travels, including on a secondment to the Swedish International Development Cooperation Agency (Sida) in Stockholm. 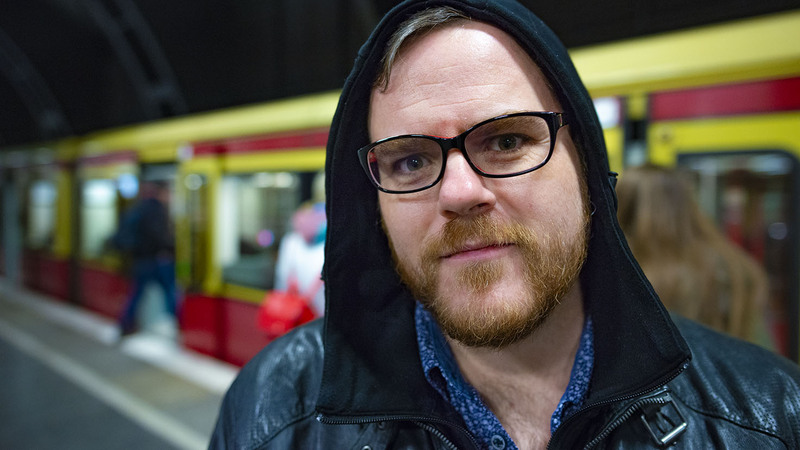 Then, after several years of working in the public sector, Joshua felt a desire to move back into the private sector, a decision that led to Berlin. It’s a sunny morning in Berlin. A crowd of protestors is marching towards Brandenburg Gate. They are there to stand in solidarity with the latest victims of gun violence in Parkland, Florida. Among the motley bunch of chanting expat Americans and sympathizers, there is a tiny horn sticking out of the crowd. 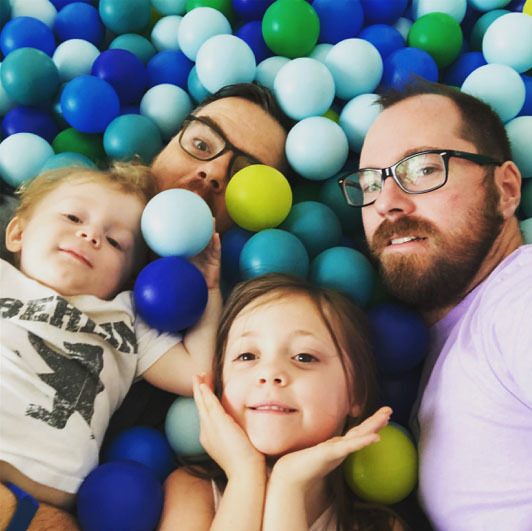 It is Joshua’s daughter, five-year-old Wren, sitting atop Scott’s shoulders. She’s wearing a unicorn onesie, complete with horned hoodie. 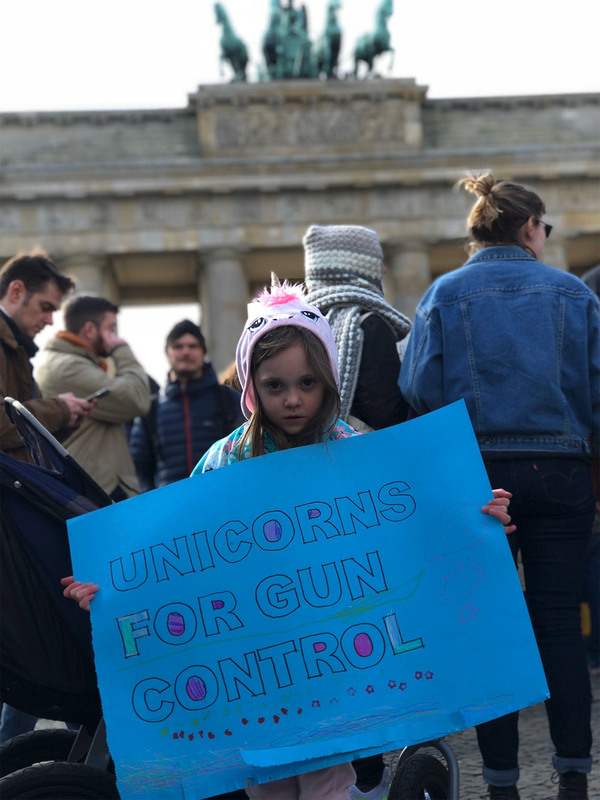 She is holding up a sign that says “Unicorns For Gun Control,” a sign that the family created together. The protest goes the way that most protests go. People make speeches and then they hand over documents to the American embassy, documents that may be read by important people. But maybe not. Probably not, if we’re honest. Joshua knows the point of these kinds of protests is more to show support. Or, to put it another way, the fact of it says more than its direct consequences. “Truth doesn’t live on a two-dimensional plane — solutions tend to cover up symptoms of the problem. We need a more complicated approach. Truth is three-dimensional,” he says. The scene manifested Joshua’s evolving view on how to affect and benefit the world. As a teenager, it began white hot with idealism. Yet now, having been cast through the prism of life, bureaucracy, and economic reality, it has not been dimmed. It has refracted into a diversity of colors. Some of them the hue of fatherhood, others tinged by corporate pragmatism, others still tinted by hope. A hope to change at least a few people’s lives. Is that activism? Maybe the answer doesn’t matter. The speeches end at Brandenburg Gate and the crowd disperses like a flash mob. Wren comes down from her father’s shoulders and she points her horn toward an ice-cream store.